Dwight David Eisenhower was born in Denison, Texas, but raised in Abilene, Kansas. He was one of the greatest military men in U.S. history, and he was the 34th President of the United States. He received an appointment to the U.S. Military Academy at West Point after receiving a declination from the U.S. Naval Academy because he was too old to enroll there. Following his graduation from West Point, where he finished in the upper one-third of his class, Dwight Eisenhower was commissioned a second lieutenant, which began his distinguished military career. Dwight Eisenhower spent his boyhood years on a family farm in Abilene, Kansas where he worked at typical farm chores, such as milking the cows and feeding the animals. He often gathered vegetables which he sold to people in the small town to earn money. Eisenhower and his five brothers all worked as the family was poor. His father, David, although a college educated engineer could never find employment in that field, so he worked at menial jobs his entire life. His mother, Ida, was a devout Mennonite and a fascist who believed in the peaceful settlement of conflict versus fighting and war. She did not, however, contest Dwight's entrance into West Point, believing that he should pursue the career of his choosing. At twenty-five Lieutenant Dwight D. Eisenhower married Mamie Doud, 19, on July 1, 1916 at her home in Denver, Colorado. They initially lived in sparse quarters at Fort Sam Houston before beginning a life of many relocations due to Eisenhower's military assignments. They had two sons, Doud Dwight, who died of scarlet fever before his fourth birthday, and John Sheldon Doud born in 1922. Little Ike, Ike and General Ike: According to family members, every son of David and Ida Eisenhower was called "Ike" at some point in their childhood. The nickname, however stuck with Dwight. He was called "Little Ike" and his brother, Edgar was called "Big Ike" during their early years. As Dwight progressed through his military career, the name "General Ike" became his nickname. The Kansas Cyclone: This nickname came as the result of his talent in the game of football, where he played the position of ball carrier or running back. Duckpin: Ike's was given this nickname because he loved to play duckpin bowling which has smaller pins and balls than those used in traditional bowling. As a Second Lieutenant, Eisenhower worked in Fort Sam Houston in Texas as a military trainer, specifically in the tank division, which disappointed the young soldier. Eisenhower wanted to go to Europe where the war was, but World War I ended a week before he was scheduled to go. During peacetime, Eisenhower was a military aide to Generals John J. Pershing and Douglas MacArthur, but recognition and promotion came slowly. When the U.S. entered World War II, Dwight Eisenhower was transferred to Washington, D. C. as a planning officer. The Army's chief of staff, General George C. Marshall assigned the young officer to escalating commands that resulted in his becoming Supreme Commander of the Allied forces in Europe. Dwight Eisenhower returned to the United States as the Army's Chief of Staff, a highly-respected, very decorated and popular war hero. 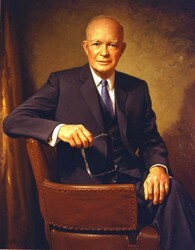 Dwight D. Eisenhower was elected President of the United States for two terms, serving from 1957 until 1961. As president, Eisenhower was instrumental in strengthening Social Security, establishing the Interstate Highway System and securing the Civil Rights Act of 1957. He was as popular as a president as he had been during his active military career; his leadership skills and strategic capabilities gained him international respect as he worked to establish peace during the Cold War and at home as he progressed toward securing equality and civil rights for Americans. Following his presidential years, Dwight Eisenhower and his wife, Mamie, retired to his farm in Gettysburg, Pennsylvania where he raised cattle, painted, wrote his memoirs and traveled. He also became an advisor to Presidents John F. Kennedy and Lyndon B. Johnson on matters involving Vietnam and the U.S.S.R.
By 1965, Eisenhower had coronary disease which caused eight heart attacks during the next four years, ultimately causing his death on March 28, 1969. He was a general to the end, commanding his attending physician to lower the shades and raise his bed to a sitting position in preparation for death. He was buried in Abilene, Kansas near his deceased son. The sight is now the resting place of his beloved wife, Mamie.